What animal has more bacteria in its mouth than a sewer? The Komodo dragon of Indonesia. Komodo dragons are the largest reptiles on earth. They grow to 10 feet long and weigh over 300 pounds. They live in remote mountains. They’ve lived on the earth for millions of years, but were only discovered by humans 100 years ago. All about the Komodo Dragon: They are the largest reptiles on earth. They grow to 10 feet long and weigh over 300 pounds. Komodo dragons are fierce carnivores. They’ll eat almost anything they can catch, including wild pigs, deer, water buffalo and even humans. Komodo dragons are sneaky hunters. They hide in the brush and grass in wait of prey. Komodo Dragons eat almost anything they can catch, including wild pigs, deer, water buffalo and even humans. When an animal walks by, the Komodo dragon attacks — slashing the animal with its sharp claws and serrated teeth. Any animal that escapes usually dies within 24 hours. 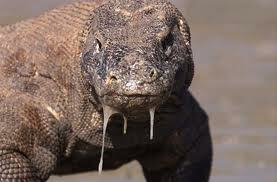 Komodo dragons have more than 50 kinds of bacteria in their mouths. These bacteria poison the prey and cause infection and death. In addition to deadly bacteria, Komodo dragons have poisons in their saliva that prevents blood clotting. Animals often bleed to death after an attack. Komodo dragons have a strong sense of smell. They can follow their victims for miles until the animal dies. Komodo dragons can eat almost their entire body weight in one meal – up to 260 pounds! That’s like you eating 150 hamburgers in one meal! Komodo dragons sometimes feed in groups. Bigger dragons even eat younger dragons. These fierce predators eat almost every part of an animal, including the bones and hooves. Young komodo dragons sometimes roll in their own poop so the larger dragons won’t eat them because of the icky smell. Komodo dragons lay eggs in a hole in the ground. After the eggs hatch, the babies scramble into trees. 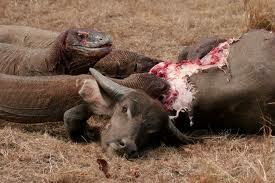 A documentary video about a komodo dragon hunting a buffalo. 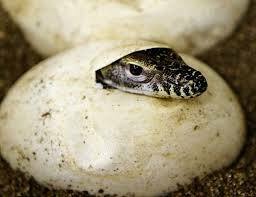 Question: Do Komodo dragons lay eggs? Answer: Komodo dragons lay eggs in a hole in the ground. After the eggs hatch, the babies scramble into trees. They’ll stay in the trees eating bugs for about four years so the older dragons don’t eat them. How would you like to live in that family? 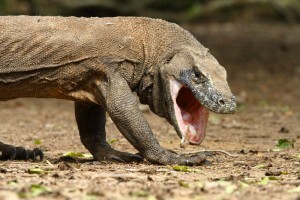 Enjoyed the Easy Science for Kids Website all about the Komodo Dragon info? Take the FREE & fun all about the Komodo Dragon quiz and download FREE Komodo Dragon worksheet for kids. For lengthy info click here. Declan, Tobin. " Komodo Dragon Facts for Kids ." Easy Science for Kids, Apr 2019. Web. 24 Apr 2019. < https://easyscienceforkids.com/all-about-the-komodo-dragon/ >.